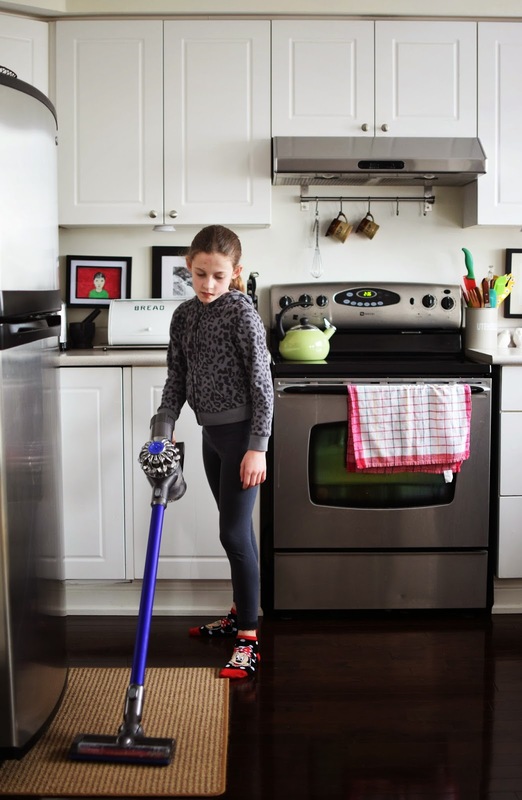 The more children and pets you have in your home, the more mess there is to clean up. Add to that the fact that those very same children and pets require care and attention that prevents you from spending a lot of time cleaning and you've got a challenge on your hands. Are you with me? So, in between walking the dogs, taking the children to appointments and activities, work, grocery shopping and making dinner, there's some housecleaning to be done. When I moved to this house seven years ago, I was delighted to have central vac. But it turns out that in actual fact that long vacuum tube is quite unwieldy and inconvenient - not the ideal thing to grab when the cereal gets knocked over or one thousand bracelet beads get dropped on the floor. And that big ole vacuum rarely got put away, so people were constantly tripping on the hose (or using it like a tightrope in the case of the kids). Having heard great things about Dyson products from family members and friends, I turned to them to help me with my vacuuming challenges. I was looking for a vacuum that could tackle the challenge of pet hair (and dog toy stuffing) from my two beautiful rescue dogs, Jolene and Ace. And it would have to handle picking up all of the tiny bits and bobs that get knocked over by a certain little blue-eyed princess who shall not be named. 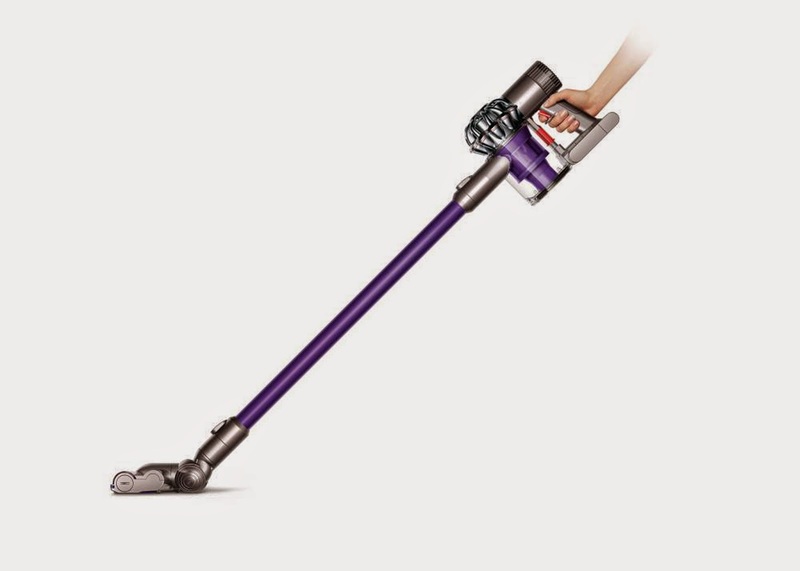 Enter the Dyson Digital Slim™ DC62 vacuum. It has all the power and technology that Dyson is known for, in a sleek and handy cordless unit. I consider my cleaning challenge level moderate to high. 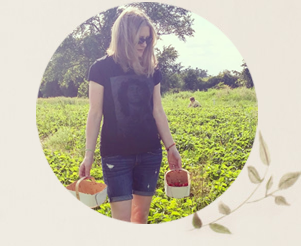 I can't put myself purely in the high category, because I have witnessed my sister-in-law's challenges - she has four kids, two dogs, two turtles, a cat and a whole bunch of chickens. But two children, two dogs is challenge enough for me. The Dyson Digital Slim™ DC62 has provided us with a newfound feeling of freedom. 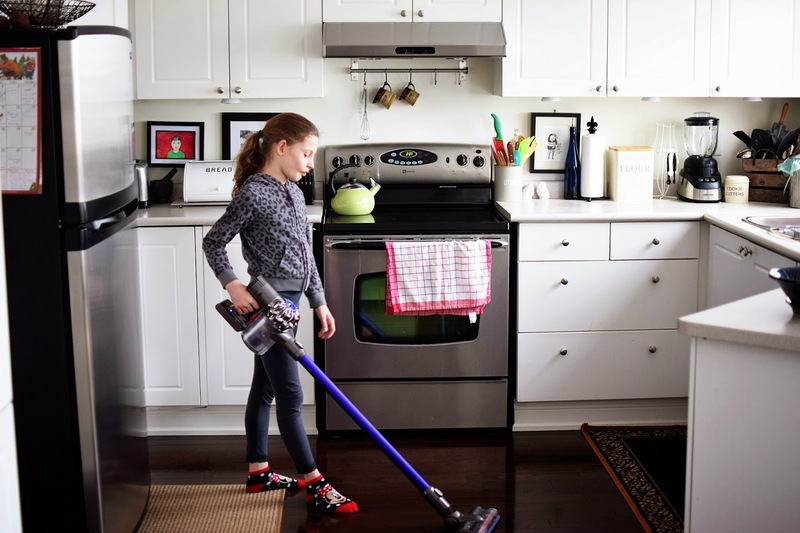 Although a once-weekly vacuuming is my husband's "job," the well-used areas of our home, like the kitchen and family room, really need a daily clean-up. Pushing this lightweight, cordless vacuum from room to room, over both plush carpet and solid hardwood, is easy and quick. That makes me more inclined to vacuum. 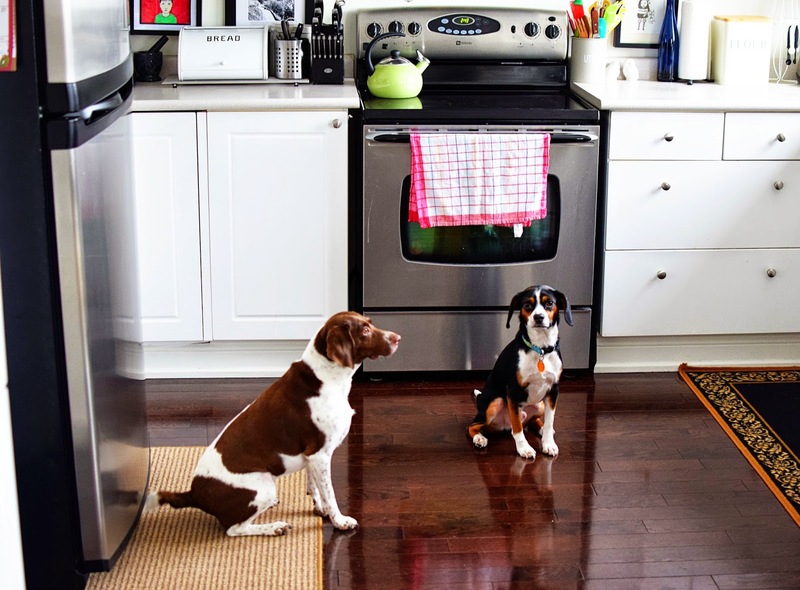 I can hit high-traffic areas like the kitchen and the main hallway more often and pick up food crumbs dropped by the kids faster than the dogs can lick them up. And it's so lightweight and easy that the kids actually enjoy using it. Bonus! Watching the clear, bagless canister fill up with pet hair and dust is truly satisfying. The Dyson seems to hug tight to the floor or carpet. And with the MAX setting providing an extra boost, the vacuum is even fully capable of pulling up pet hairs off an area rug or floor mat. I'm convinced it picks up dust that my central vac left behind too. Even my husband says it works better than the central vac. On the technical side - 15 cyclones work in parallel across two tiers to capture fine dust. Carbon fiber anti-static bristles reduce the build-up of static to effectively capture fine dust on hard floors. Nylon bristles trap ground-in dirt from carpets. On the user side - you can see the very fine dust right in the canister. And you simply push a button to release the dirt directly into your garbage can. Because it's cordless and using the vacuum drains the reserved power, you must keep your finger on the power button to keep the vacuum running. I found I had to get used to that at first. (I don't have my husband's strong, guitar-playing fingers!) But this feature enables you to preserve power so you can cover more ground. 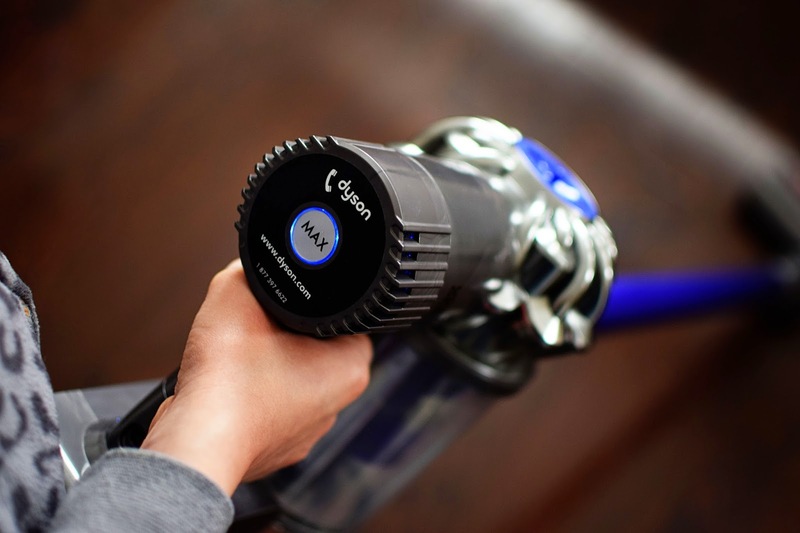 The Dyson Digital Slim™ DC62 vacuum offers 26 minutes of cleaning performance. It maneuvers great around and under furniture and against walls and cabinets. And it's great for doing the carpet on stairs, because it's light (4.4 pounds) and just the right size to sweep each step. It has a handy docking station that you can mount to the wall in a convenient location, close to an electrical outlet so you can charge it up while it sits. According to James Dyson, the digital V6 motor gives DC62 three times more suction power than any other cordless vacuum. The small, dense motor is near the top of the vacuum, making it easy to clean up high, down low and in-between. The lightweight aluminum wand can be detached for stairs, furniture upholstery and car interiors. One astounding fact that I noted in my Dyson research is that Dyson invests £1.5 million a week on research and development! The company has 1,536 engineers and scientists working on its technology. I for one have seen the difference their technology makes. Anything that shortens our cleaning time and makes our house look great is tops in my book. Would you and your home benefit from Dyson's cordless technology? *I received product for review purposes. The opinions are authentic and my own. Thank you for supporting the awesome companies that partner with Woman in Real Life! I have the regular Dyson but was wondering about this lighter weight one for everyday - sold! Joann I am in terrible need of one of these ...for the very same reasons! Two furry felines and a blonde pug who is a terrible shedder. I think I will have to get me one of these. I have a Dyson barrel vac that we bought with wedding present money back in about 2003. I remember trying it out in the store. The store guy tipped a heap of dust and crap on the carpet and let me have a turn with the vac. I couldn't believe the suction! On the day I bought it, I had vacuumed my house with a regular crappy non-cyclonic vac. But oh my goodness, when I vacuumed the same day with the Dyson the entire barrel filled up! I also bought the hand held one but never got the long attachment though I think I could attach the regular hose. I haven't had it in years because my mum borrowed it and I said she could keep it. I might ask for it back ;) We also have the pet and human hair sweeper head. This is amazing, because the regular sweeper head kinda sticks hair and fur in to the carpet but the hair-fur sweeper head has the rotating brushes that gathers it all up. We got our vac serviced a few months ago as the hose had split (no doubt because of tightrope walking kids here!!!) and it's as good as new now. I love love love my Dyson and I wanted a washing machine but they were never sold in Australia (and now they don't make them anymore). Yes, my house has benefited incredibly from my dysons. I have an upright DC25, and just got the DC72 from a twitter party, and my DC72 blows my DC25 away. #DysonMagic , it picks up cat hair and dust my other one leaves behind. I have an absolute crush on all things Dyson! This one looks perfect for daily clean up! I have one and I love it! I use it every day. GAH. I have seen the commercials. 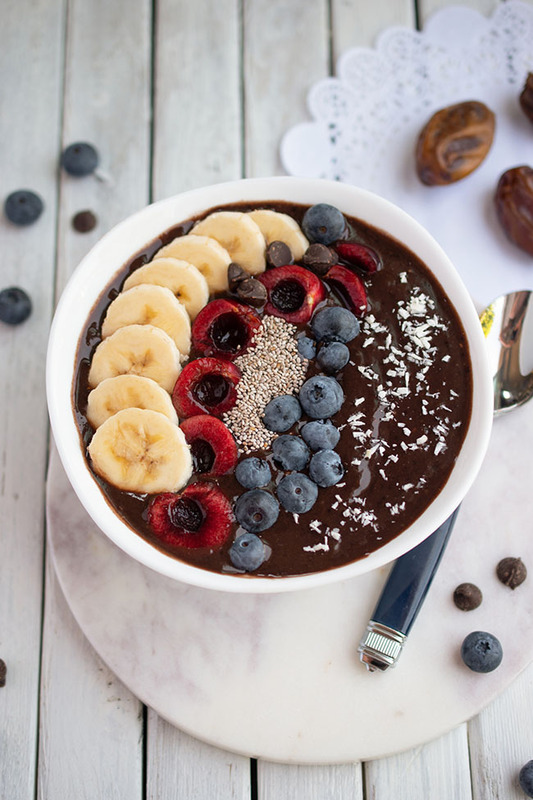 IT LOOKS AMAZEBALLS!!!! I need to get me one of these badboys! We have hardwood pretty much everywhere but still lug out our big beast! Oh, the big beasts. Such a pain. And hard to hide away! We keep ours in our tiny laundry room and it takes up valuable space. Wow! Looks super cool, lightweight and easy to use. I guess all that matters is that it does the job but nice to have the kids do it too ;) Great pictures btw & great review. I want one now too! !